EURUSD moved sideways in a trading range between 1.1183 and 1.1254. 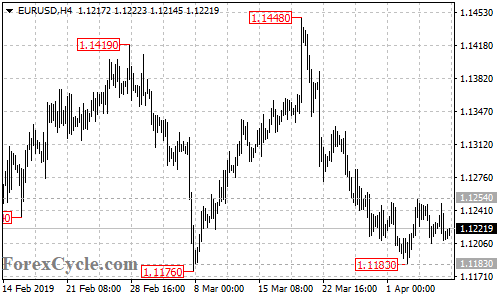 As long as 1.1254 resistance holds, the price action in the trading range could be treated as consolidation for the downtrend from 1.1448, a breakdown below 1.1183 could trigger further downside movement to 1.1150 area. On the upside, a breakout of 1.1254 resistance would indicate that the downside movement had completed at 1.1183 already, then next target would be at 1.1300 area.